A snapshot of the mathematical framework using Gaussian kernels (orange peaks) to identify clusters of insertions (blue bars) that lead to cancer by disrupting the function of genes (green bars). Click for larger image. By interrupting genes and recording the consequences, we can reach a better understanding of how cancers function. In a recent study, the Experimental Cancer Genetics team at the Wellcome Trust Sanger Institute used this approach to identify the genes involved with liver cancer. We worked with groups in Singapore and the Netherlands, using a specific mouse model of liver cancer in combination with a method to induce tumours. 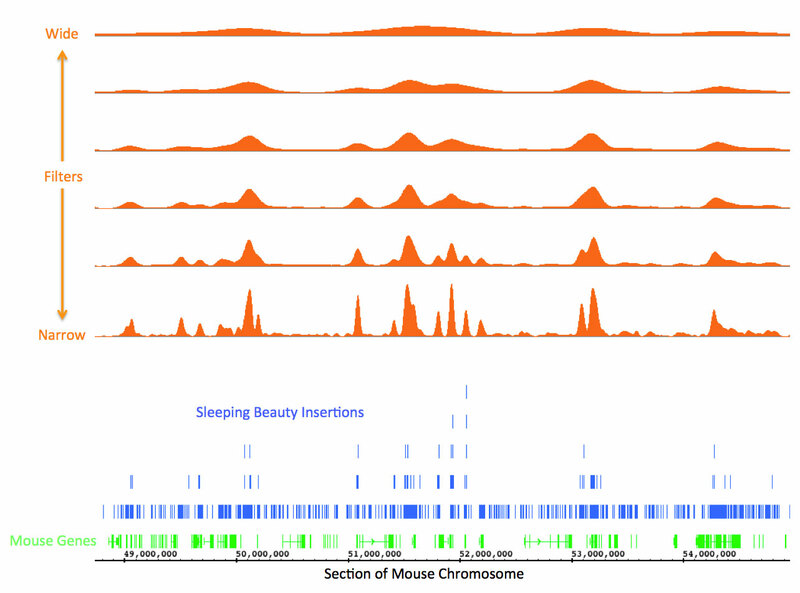 The fancy name for this method is transposon-based insertional mutagenesis and we used a particular type of transposon system called Sleeping Beauty. Transposon studies offer alternative scientific insights into cancer, complementing the large number of genome sequencing studies undertaken here at the Sanger Institute. Transposon insertions are like putting spanners in the works; when insterted in and around genes they can cause genes to malfunction. If these insertions cause a speed-up in the creation and development of tumours, then it is reasoned that the malfunctioning genes must be co-operating with each other to cause the cancer. However, not all of the places in the genome that the insertions hop into cause genes to malfunction. One of the challenges is therefore to identify the insertions that directly effect the development of cancer tumours. To do this we worked with some great collaborators at the Netherlands Cancer Institute in Amsterdam. In essence, they created a mathematical technique to identify clusters of transposon insertions in the genomes of mice in which tumours have developed (a simplified version of the approach is shown in the figure above). Clusters of insertions are significant because they are thought likely to mutate the genes in which they are found. In this study we identified a list of several hundred genes involved in liver cancer. This list provided a jumping-off point to perform validation experiments in the lab. However, implicating such a long list of genes to a cancer does go against more conventional wisdom, in that only a handful of mutated genes are thought to be drivers of a specific cancer. My own view is that genes interact with each other via genetic networks and, as such, this long list contains genes from a number of different networks. The follow-up lab work helps us to identify the connections between the mutated genes and how they can be divided into separate networks. It is like being given a list of stations on the London Underground tube network but without any information as to how the stations are connected together. So you are left with taking the list of tube stations and working out which lines they are on and how they are connected. In this study, for example, the list of genes sub-divided to show a number of different genetic pathways being used in this type of liver cancer. Cancer uses many pathways and transposon studies such as this one help us to better understand these complex interactions. Alistair is a Principal Bioinformatician in Dave Adams’ group at the Wellcome Trust Sanger Institute, uncovering cancer genes using mouse models. Bard-Chapeau EA,et al. (2013). Transposon mutagenesis identifies genes driving hepatocellular carcinoma in a chronic hepatitis B mouse model. Nature Genetics. doi:10.1038/ng.2847.